Sometimes a photography is a window to the world, and the right frame makes all the difference. Some of our favorite projects at Hamilton Color Lab is when a customer brings us a vision and the result is better than they envisioned. When Otis Twelve came in with a large unique frame he found in an antique shop and an image to print, this project piqued my interest. Sometimes the picture frame takes an ordinary photo and makes is extra-ordinary. The photo was formatted on a disc and I didn’t have an opportunity to see the image until it was printed. Considering the frame we were fitting it to I was very anxious to see what type of image could stand up to this magnificent frame. Normally fine art photographs are printed with a white border, but this frame said otherwise. The frame was crooked and almost a half inch shorter on one side than the other. So the border distance would of been apparent. After consulting with our customer the decision was made to frame flush to the photograph. What a dramatic difference! Our framing technician was also impressed on how the red leaves in this snow scene just popped and matched the red tones of the frame. This work of art is truly like looking out of a window into the world and reminded me of the quote by Conor Oberst. I am certainly tired of winter, the snow, and ready for spring and some sunshine. The only snow I want to see is in a photograph, as if I’m inside looking through a window. If you have a unique frame, and a vision for a photograph bring it to Hamilton Color Lab in Omaha, Nebraska. We are the only custom professional photo lab in the state and can print any size and turn your ordinary photo into a work of art. 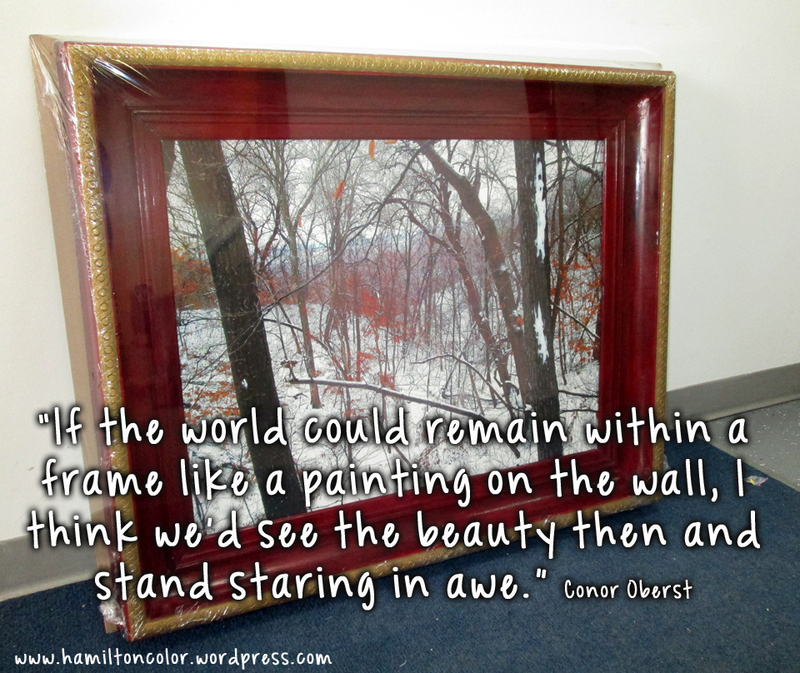 Categories: Digital Prints | Tags: Conor Oberst, custom framing, fine art photography, framing, landscape, omaha, Photograph, Photography, Picture frame, quotes, snow, Visual Arts | Permalink.